Adrenalin ~ was bred and raised by Bill and Sue Burton when they lived in New York. Adrenalin, born in 1998, was sired by Headliner and out of the great clone cow and multiple value producer Overlyn. The first over 6' T2T bull, Over Head was born in 1998, a full brother to Adrenalin. When Adrenalin was born the hopes were so high for Over Head it was hard for both brothers to be used by Burtons. 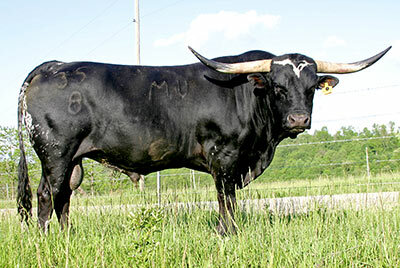 Although Burtons used Adrenalin starting in 1999 it was a time they were moving and the main herd was at Cleveland, TX. Adrenalin was acquired by Dickinson Cattle Co and moved to Ohio in 2001. He sired a lot of black heifers born in 2002 and a half interest was sold to Dr. Keith Berkeley. When the Berkeley term was finished he came back to DCCI and sired calves born in 2006. With a lot of black calves at DCCI he was sold to Van & Travis Ramsey in 2009 and his final home was Glenville, WV. With close observation, Adrenalin (that was a name given him by Sue Burton, the source of a lot of great names) was blacker than a Benghazi midnight. His beautiful black hide shined like the patent leather on obama's bicycle seat. His back was wonderfully straight. He was trim, gentle and a lot of ham muscle. As he worked for DCCI a number of these dark colored trim-necked cows evolved. One was Shining Through who was bred to Victory Lap and produced Shining Victory the dam of Drag Iron. It is not real easy to see but some of the sweet things on Adrenalin slightly pop out on Drag Iron. Everything has to come from somewhere and every ancestor's virtues count. Thank you Bill & Sue for Adrenalin.